Enlarge / Scorpion has come a long way in Mortal Kombat 11, but he’s still a golden ninja with flaming powers, so it works for me. I was 15 when Mortal Kombat first hit the arcades in 1992. It was a different era then—no social media, no modern Internet to speak of, and we didn’t have year-long teaser campaigns for new games. You would just walk into the arcade one day and there was a new cabinet sitting there, maybe back in a corner, like a secret, or maybe in the center of the floor, already gathering a crowd. Being nostalgic for your teenage years is easy, and I don’t want to over-mythologize the arcade of my youth. But there was something special about getting those surprises, and we’ve lost that. It seems rare now to be hit with the unexpected—dodging spoilers is practically a contact sport. Here was this game like nothing else we’d seen before, and it just appeared. We were already fighting-game players. Street Fighter II, Fatal Fury, World Heroes—we dropped our quarters into every game we could get our hands on. But Mortal Kombat was different. You heard it first. The arcade put Mortal Kombat in the middle, so you didn’t see it the moment you walked in the door. The rumble of the subwoofer was the first clue there was something new. No other game had bass like this. When the announcer shouted FIGHT or TEST YOUR MIGHT, you could practically feel it in your bones. The sound of the gong cut through the noise of other games. We’d seen digitized characters before, in games like Pit Fighter, but those were choppy and stiff. Mortal Kombat‘s characters had idle animations, they shot electricity, and there was a sea of bobbing, bald-headed monks watching you fight. The game looked, felt, and sounded so visceral and real. Uppercuts sent your opponent flying in a wonderfully meaty way while blood splattered everywhere. We were hooked from the start. Then, of course, I saw my first fatality. I’m pretty sure it was Sub-Zero tearing someone’s head off and holding it up, their spine still dangling below it. FATALITY. We didn’t know Sen. Joe Lieberman was going to lead a moral panic and that it would spark the best console war ever (Genesis’ blood cheat code versus Super Nintendo’s sad, gray “sweat”). We just knew it was amazing, and we had to know how to do it. I became a Scorpion player, if for no other reason than I could do his fatality: space yourself right, hold block, press up up, and he’d take his mask off to reveal a flame-spewing skull, torching his enemies into Uncle Owen and Aunt Beru. It was violent, realistic, and cartoony at the same time, and I loved it. I kept playing for a few years. Midway knew it had a hit, so the company kept releasing new versions of the game that one-upped the environments, characters, and, of course, the violence. After Mortal Kombat 3, I left for college and stopped going to my favorite Market Street arcade in San Francisco, which later closed. The series moved to ugly 3D graphics, and I stopped following it. Fast-forward to the end of 2018: NetherRealm Studios, the company created by Warner Bros. to carry the MK torch, announces Mortal Kombat 11. I’m still a fighting-game player to this day, still playing Street Fighter and whatever else I get my hands on, but Mortal Kombat just wasn’t something I paid much attention to anymore. Something about the new announcement stirred all these arcade memories, though, and I found myself looking forward to today’s reveal event. Wow. I’m in the arcade again. I know these characters. Well, some of them, at least. And it looks gorgeous. We’re so spoiled by modern 3D graphics that it’s hard to come by the surprises of the arcade days, but this is still a great-looking game. Textures, models, lighting, environments—everything has been given a high level of polish and love. My 15-year-old self would be blown away, that’s for sure. All these years later, Scorpion still throwing his spear and shouting GET OVER HERE! I’m not 15 anymore, and I have to admit a little bit of old-man feelings creeping in while I watch these fatalities. It’s, well, a bit much. Gone is that heady blend of realism mixed with the cartoony. The new finishers are a little uncomfortably real. Not sure I needed to see someone’s bloody eyeball speared through the back of their head. My inner teen is cheering, I can’t lie, but the rest of me isn’t so sure this level of realism is what fatalities needed. Still, there’s no denying that this is a good-looking game. The story is apparently convoluted and crazy, but it looks well done and is clearly not throwaway content. The reveal showed off a very robust character-customization engine, and I’m a big fan of personalizing and owning your character. 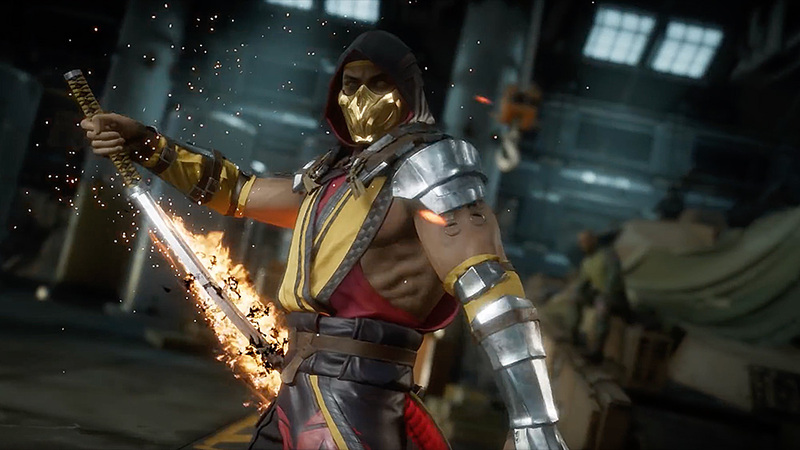 NetherRealm is known for packing a lot of single-player content into its fighting games, and MK11 looks like no exception. If you’re not a fan of online play or you don’t have any friends to try versus mode with, you’re going to still have plenty to do. I’ll always be nostalgic for the original game. I still think the magic of the arcade is something special beyond just wistful youthful memories. But the legacy clearly lives on, and there’s hopefully a new generation to get hooked on ripping people’s heads off. It might be a little more realistic than I’m comfortable with, but if Mortal Kombat doesn’t make the adults queasy, is it really doing its job?